I picked How to Love up off my stack last night after finding my mind wandering listlessly away from the book I was trying to read. The writing kept losing me, the characters insisting on overstating everything and questioning themselves ridiculously. I was lost. So I grabbed Katie Cotugno's debut novel and flipped to the opening page. Now this is writing, I thought almost immediately. I'd read almost universally positive reviews of this one, and I had high hopes for a contemporary with meat on its bones and characters I could see and hear and care for. From the first page, Reena's gasping, tight narrative sucked me in. And I settled in happily for a late night. Reena Montero always planned on seeing the world. She planned to be a travel writer and share her experiences with other worldwide vagabonds. She even got accepted early into Northwestern's writing program and was all set to kick the dust of her hometown behind. Except she didn't. Instead, she got pregnant. The baby's father, her sometime boyfriend and all-time crush, left town before she could tell him. And she's spent the last couple of years becoming a mother, raising her baby girl Hannah, working at her father's restaurant, and taking community college night classes. She doesn't even recognize her life anymore. And then Sawyer comes back to town. They cross paths in the local 7-Eleven, and he acts like everything's fine. Like he didn't disappear without a trace, leaving her heart in smithereens and her baby without a father. But there's so much water under the bridge between Reena and Sawyer at this point, she can hardly summon the will to fight anymore. And so Sawyer works his way back into her life once more, just like he's always done. But whether or not they can see past all the old pain to find a kind of life together is another question entirely. "My mom told me," he says now--trailing off, trying again. "About . . . "
I imagine letting him dangle there indefinitely, a hanged man, but in the end I'm the one who breaks first. "Hannah," I supply, wondering what else his mother told him. I can't stop staring at his face. "Her name is Hannah." "Yeah. I mean." Sawyer looks uncomfortable, like he's waiting for something else to happen. For me to just come out and say it, maybe--Welcome back, how was your trip, we made a baby--but I keep my jaw clamped firmly shut. Let him wonder for once, I think meanly. Let him sweat it out for a change. The Slurpee's bright green, like a space alien. My braid's left a wet spot on my shirt. Sawyer shifts his weight awkwardly. "She said." We stand there. We breathe. I can hear the hum and clatter of the market all around us, everything chilly and refrigerator-bright. There's a huge, garish poster of pretzel dogs over his left shoulder. I have pictured this going differently. I told my father I was pregnant and he didn't speak to me for eleven weeks. I only blame him a little: His own parents died when he was seven, and he was, quite literally, raised by the nuns in Saint Tammany Parrish in Louisiana. He fully intended to become a priest until he met my mother; he confesses every Friday and keeps a Saint Christopher medal tucked inside his shirt. In his heart he's a musician but his soul is that of the most serious of altar boys, and the fact that he didn't send me away to some convent until I had the baby is probably a testament to the mercy of the God that we've always prayed to in my house. I really love the way she writes. But as I read through the alternating chapters between the present day and the past, I found myself less and less enamored of the way it was all going down. And absolutely disenchanted with Sawyer LeGrande. The more time I spent with him, the less there was left of him. Until I was sitting there holding a pile of dust in my hands where once there was a young man who'd run away and returned home years later to find he was a father. The farther back we went in time, the more distressed I became at the realization that Reena's lifelong love was . . . empty. And, what's worse, there seemed to be so little explanation offered for Sawyer's blankness, for his wild youth and his inexcusable treatment of Reena. Honestly, it was an excruciating place to find myself as a reader, wanting so badly for them to work things out because of Cotugno's mighty skills with atmosphere and Reena's very real feelings for Sawyer, and at the same time filling up with a growing sense of betrayal as page after page revealed Sawyer to be . . . just no one to hold on to. And there was little evidence of him having changed in the present day chapters. No more bad boy, but nothing really good either. I missed the Sawyer of those first pages. The Sawyer and Reena of those first pages. The ones who had so much to say and no words to say it in. Who were facing a mountain to climb. I wanted to see them climb it. I wanted them to fight for something precious and worth having. Instead, the past revealed too many cracks and the present proved hopelessly inadequate at sealing them up. Add to this the couple of occasions of ham-fisted coincidental drama for nothing but drama's sake, and I wanted to go wash my hands of the whole debacle. Such a shame. Because that opening scene? That was something special. 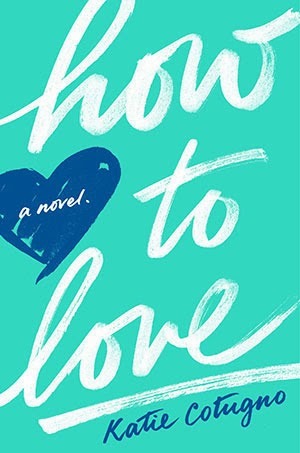 Alexa Loves Books - "How to Love is one of the strongest contemporary releases of this year. Cuddlebuggery Book Blog - "How to Love made me me feel the whole rainbow of feels, Katie Cotugno’s writing is gorgeous." Good Books & Good Wine - "I could not 100% get behind the romance in How To Love." Novelicious - "A refreshing alternative to the traditional pattern of boy meets girl." The Savvy Reader - "Who we love and how we love makes us who we are, and Cotugno shows this beautifully in her debut novel." CAUTION SPOILER COMMENT: I thought the last bit, in which they go off with a baby and no job, no money, no day care - totally absurd! Absurd is the word. By that point I was so disenchanted it was difficult to summon the will to mark the "happy" ending. Lol. I know. Everyone loves it. If you do, let me know! Oh my word. Talk about a Sawyer worth holding onto . . .